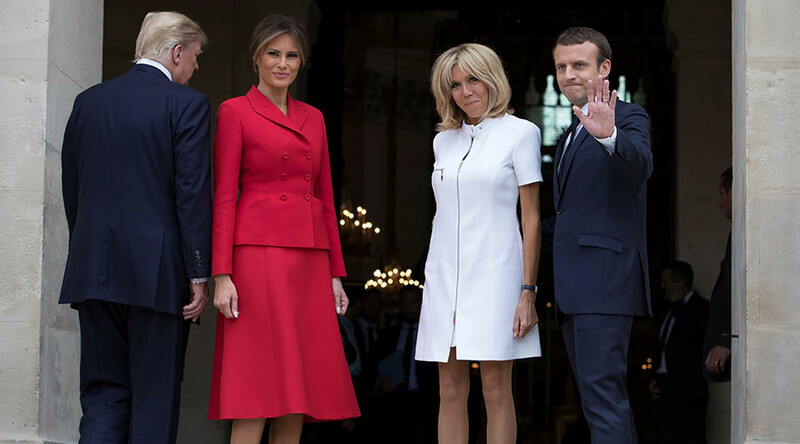 Donald Trump inspired a collective cringe after telling French President Emmanuel Macron’s wife, Brigitte, she was in “good shape," seemingly unable to mask his shock that an older woman could be so trim. Trump’s comments were met with a combination of disgust and embarrassment online. Earlier in the day, he was also caught giving her one of his awkward handshakes that saw him grasp her hand and pull her towards him. Many pointed out that Trump was seemingly amazed that a woman of Brigitte’s maturity could possibly look so good. Perhaps not a surprise given Trump’s penchant for marrying women much younger than himself. Others said his comments were patronizing and insulting to Brigitte. @katesang oh good grief. Patronising predator!!! Horrid, just horrid! Curiously, the age difference between Macron and his wife and Trump and his own are both 24. Only in Trump’s case, he’s the older one.